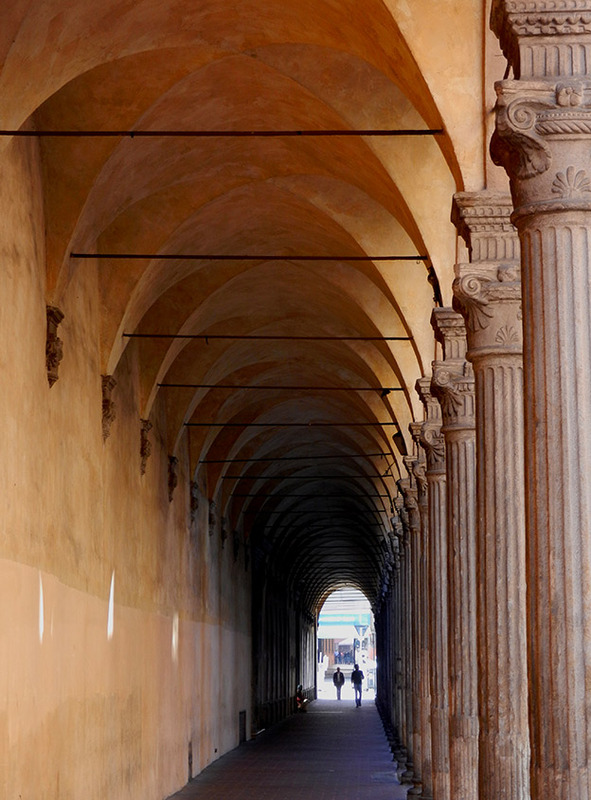 In Bologna many streets are lined with such colonnades. This what is sometimes called Architecture; something outside oneself but that volume which enters the domain of consciousness. But what architectural practice is: is not necessarily controlling the overarching schema but learning how the actual objective details are made. The closest collaborative disciplines are, history, literature, geometry, engineering, and psychology. What a city represents is the desire to replicate Creation itself, i.e. bringing order from chaos but modern cities fail miserably at this since chaos prevails insidiously disguised in the form of material progress and human submission to mechanisation. The paucity of civic joy is represented exactly by the symbolically impoverished aesthetic of modern constructions. The antidote is deep knowledge. The necessary kind of creativity is not the propensity for fantasy but the rediscovery of rhetoric as the art of communicating the truth as the underlying motivator of Being where a learned architecture embodies the community's mythical formation in its very organisation via the process of extracting order from chaos in words and in deeds. In the restoration of civic order, historical cities just have to get rid of the rubbish that has grown around them. Cities of the new world have a long term problem in having destroyed their Logos in the expediency of procuring wealth. Paik Associates is engaged in the practice of treating architecture as an objective system of symbolic representation in the dome of human perception; an architecture in symbiosis with nature aspiring to the highest ideal, contextually engaged and above all, pleasing from every point view.